Is there an easy way to reglue/reattach the fabric that is sagging down from the interior roof? 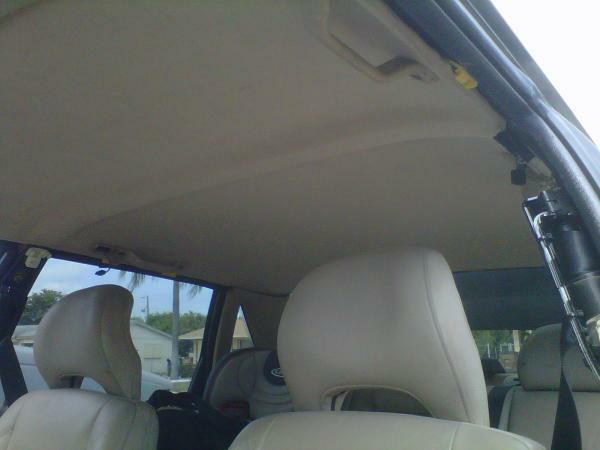 The fabric has also come off the leading edge of the sunroof, so that needs to be repaired as well. We're going to try to use 3M spray adhesive to repair my sons 850. Probably this weekend. I'll let you know how it goes. I had the same issue with one of my other cars. What I did was went to walmart when ever they sold fabric. Purchased the fabric and the 3m spray adhesive. Pulled the entire headliner out of the car. Took my wire brush and scrapped all the old material off. Vaccumed to make sure I had a bare surface. Sprayed the adhesive down on the headliner and on the fabric its self. Start from the corners first and spray and press as you go. It's farely easy and my new headliner hasn't sagged since. Good idea Butterz85. My '87 740's ceiling fabric is sagging. I use push pins to keep it up, but would like to replace it. You posted that in the fall -- how has your job held up since? I don't think trying to use 3M spray adhesive tape in such situations would really help; there are better options, though I haven't personally encountered such a situation, and tried a specific remedy. You could go the less ghetto route and just recover your head liner backing board. I got my headliner done by a pro. I got a pretty good price since I took the backer board out myself and just left it at the shop for them to re-cover. Just glue and laying down the material. Mine cost me a little over 20 in materials for both sunshade and headliner. Landau DAP HHR cement and OEM headliner material. Having a professional do the work for you is always an option, but then again one would only need a phone book. I have to say if your can get the board out yourself you've completed quite a task. Why not follow through with the upolstering? Here I used the original factory fabric. Washed it twice in a delicate cycle cleaning and removing any traces of foam backing. Did not need a pro and little $$$ about $22 for two cans of glue. Lol actually a used a coarse bristled brush and brushed it fairly clean, all the particles where screeted out after the first wash cycle, I didn't get grief from the wife yet I didn't exactly tell her. How much does it cost for a professional to do it...generally? i think you wear a rib cage t-shirt to impress and should get in touch with a car decorating shop.. they would definitely have solution to your problems. Just had my headliner replaced in Clearwater, Fl area. $250. Bill @ headliners mobile did an awesome job. I have a sun-roof too! nice , i found 1 in junk yard for $20.00, i had to remove myself....wasnt fun.. I did the headliner on a Mercedes C280 and followed the same procedure as Butterz85 except I used an actual material made for headliner WITH a foam backing. I figured the foam, if it were not too thick, would be a bit more forgiving. It went very well. I used an adhesive sold at Pep Boys made specifically for Headliner. It has been a couple of months and so far, so goo. EXCEPT... I ran out of the headliner adhesice after the headliner itself, so I went back to Pep Boys. They were sold out, but they had a super strength interior adhesive by the same company. I used that to attach fauz leather to the A, B, and C pillars and headliner material to the sunroof. That adhesive was much harder to work with, and seemed to grab immediately and dried to a hard plastic. Or, so I thought. The material sagged within days. I removed the sunroof slider and repeated the procedure on it, with a new can of the actual headliner adhesive and all is well.